Breaking the Bond, the second book in the Witches of Spring Hill series will be featured on a blog tour, May 12th through June 9th. You’ll learn more about your favorite characters through character profiles and interviews, and this time I’m including pictures of what I imagine the characters to look like. So stop by one, or all of the blogs, and don’t forget to sign up for the giveaway! Winners will be selected at the end of the tour. Thanks to Bewitching Blog Tours for putting this all together and to all the bloggers who participated in this event. ** All links will be updated on featured day with a direct link to post. Happy Spring everyone! And yes, indeed, I did capitalize Spring. In fact, it should probably be in all caps, more like this, HAPPY SPRING! That’s better… It’s been a long, cold winter for many, and although that means lots of time indoors sitting near the fireplace, wrapped in a snuggly blanket with a good book in hand, it’s definitely time to thaw out. Spring symbolizes growth and rebirth, which is fitting for my current mood. After a successful blog tour for After the Summerland, I am motivated to finish writing the fourth book in the Witches of Spring Hill series, Distracted by Fate. I am in love with my new adult fiction book that I started and can’t wait to finish it, but I am also excited to revisit my witches and breathe life into their new abilities and new experiences in their new location. I considered posting a blurb or even the first chapter here, but so much has changed from the first book that it would be a major spoiler for all my new readers. So have patience my dear readers, a new book is coming soon! In the meantime, get out there and enjoy the sunshine. Buy yourself some pretty flowers and cherish the cool spring days, because soon we’ll all be wishing it wasn’t so hot outside. I’m excited to announce that After the Summerland, the first book in the Witches of Spring Hill series will be featured on a blog tour, March 3 – 31st. Find out all you wanted to know about me, my inspiration, the books, and read unbiased reviews from bloggers. Stop by a few, or stop by them all, but make sure you sign up for the giveaway! Winners will be selected at the end of the tour. Thanks to Bewitching Blog Tours for putting this all together and to all the bloggers who participated in this event. 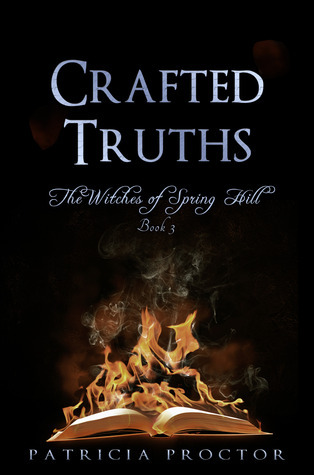 Click on the link below to enter to win one of 5 copies of Crafted Truths, the third book in the Witches of Spring Hill series. Giveaway ends March 22, 2014. Writing is such a solitary endeavor, and at times, I turn inward so much that I lose sight of everything else around me. So I decided to look back on my first year of writing and write about a few of the lessons I’ve learned. This time last year I was sitting on my couch, hunched over my laptop, writing my first book. I sat huddled over my computer five nights a week for three months until I developed back problems that required me to make changes. Now, I have an ergonomic chair and an actual desk where I write. I probably didn’t take my writing as seriously then as I do now. A year ago I wasn’t prepared for writing, and to be honest, I wasn’t even sure what would come of it, if anything. But now that I’ve written three (and a half) books, I do everything I can to increase productivity, which means preparing myself and my workspace. The reality was that I couldn’t sleep during the day. Although I made it through last year without much sleep, I can tell you it wasn’t pretty. I’m a much happier person now that I wear an eye mask and ear plugs to bed. Now I stay in bed for much longer, getting that so important sleep. 2. Don’t spend time and energy worrying about the unknown. Last year I didn’t know how to self-publish a book, so I worried about it— a lot. Worrying often made me doubt my decision to become a writer. A year later, and three books published, I realize how much time I wasted worrying. There are still things I’m unsure of, including my foray into adult fiction this time around, but I’m learning to focus on the present, on the book I’m writing today, and I’m letting go of self-doubt. I know it will only hold me back from achieving my goals. 3. Do what matters most to you, and do it well— you will be rewarded in so many ways. I’ve learned that sometimes we have to modify our lives to make room for what really matters, and for me that was (still is) my writing. More often than not that means making sacrifices that are sometimes difficult, but in the end it is worth all of the sacrifice. I’ve sold more books than I could’ve hoped for in my first year, I’ve gotten some wonderful reviews and comments from readers, and my writing has improved! Becoming better at something I love doing is such a rewarding feeling, and I’m excited and hopeful that my writing will only continue to get better with time. I truly believe that what you give your attention to in life becomes your reality, good or bad. By giving attention to my creativity, I am finding a balance in my life that I never knew was missing. And now that I’ve given attention to my imagination, it rewards me with new ideas and new story lines that I can’t wait to develop. That excites me on so many levels because it means there are many more years of writing in my future. In my first year of writing, the journey hasn’t always been easy, but it has most definitely been rewarding. I can’t believe it’s already January 15th! It seems like we just took down our Christmas lights… oh wait, we just did! Really, I’m not a procrastinator, really I’m not. It was just so darn festive having them up that I didn’t want to take them down. Which led me to thinking about how hard it is to let go of the things we really enjoy. But alas, it is January, the official season of new beginnings – new resolutions, new fitness and food goals, and of course, a new series to write. I promise I’m not done writing the Witches of Spring Hill series! In case you couldn’t tell from the little teaser I left at the end of Crafted Truths, there will definitely be a fourth book, and I have several ideas for a fifth and even a sixth book. But as I mentioned before, I had a new idea for a series that has been calling me and calling me and I simply can’t resist its pull any longer. So I’m writing my new series and already I feel a connection to my new characters. I am completely absorbed in the fantastic new world I’m creating and I look forward to sharing it with you. I won’t give away too much because it is such a work in progress, and things change at any moment, but I will say that this book is a big departure from my previous series in many ways. The biggest difference is that this book is adult fiction rather than young adult fiction as the previous series was. I’m excited to venture into this genre and am enjoying the freedom of allowing my imagination to run wild. Also, I wanted to thank all of my readers for your support, comments, and feedback. I had a better than expected first year as an indie writer and I couldn’t have done it without each and every one of you! I wish you all the best for 2014 and I hope you make this the year you follow your own dreams. 48 Hour Sale Starts Thursday! In consideration of Black Friday, Small Business Saturday, and Cyber Monday, I’m offering After the Summerland, the first book in the Witches of Spring Hill series at a discounted price for three days. I’m calling it There’s Still Some Money Left for Me to Treat Myself to an E-book Thursday. Starting Thursday, December 5th at 8:00 am Pacific Time, After the Summerland will be on sale for 48 hours. On Thursday the price will be an amazing .99 for 16 hours. If you miss that spectacular discount, don’t worry! You can still get it for $1.99 on Friday, December 6th. And if you miss those two days, you’ll still have 16 more hours to purchase it at a discount since it will be priced at $2.99 on Saturday, December 7th. So in honor of the first full weekend of December and with Christmas still weeks away, I invite you to kick your feet up and sit back with my book, After the Summerland. At this price, the only thing you have to lose is yourself – in an exciting, fast-paced story about witches.